The OGR – Officine Grandi Riparazioniof Turinwill present L’Atteso, the first solo exhibition in an Italian institution of the English artist Mike Nelson, curated by Samuele Piazza. 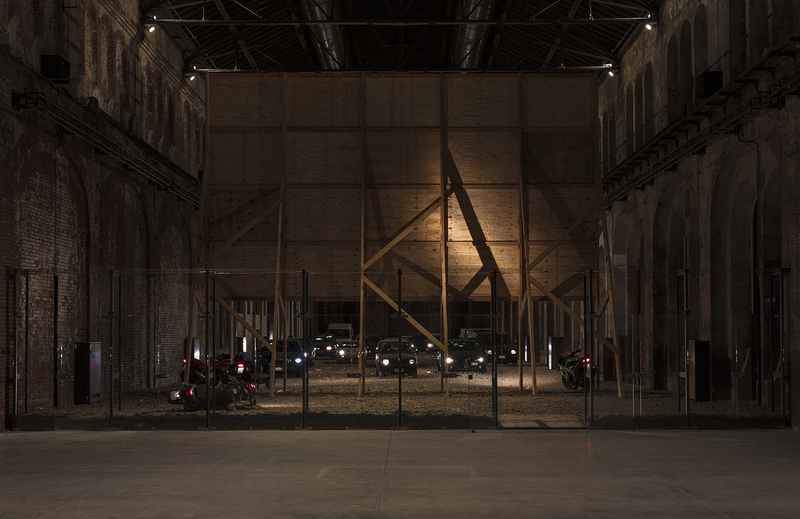 Mike Nelson- who represented Great Britain at the 2011 Venice Biennale and was twice nominated for the Turner Prize – has created a new project, designed specifically for the spaces of the Officine Grandi Riparazioni. Binario 1 appears to have been completely transformed into “another place” by a large-scale installation that takes up the entire hall with a powerful yet intimate intervention: the former industrial space is made unrecognizable, generating an alienating effect in which visitors are called to find their own personal path, to freely explore the different elements in search of the clues necessary to construct their own individual narrative. As the title suggests, a suspended and enigmatic atmosphere marks the installation, formed by a landscape that seems to come out of the images of a film and in which different memories and material layers create a narrative open to multiple readings. 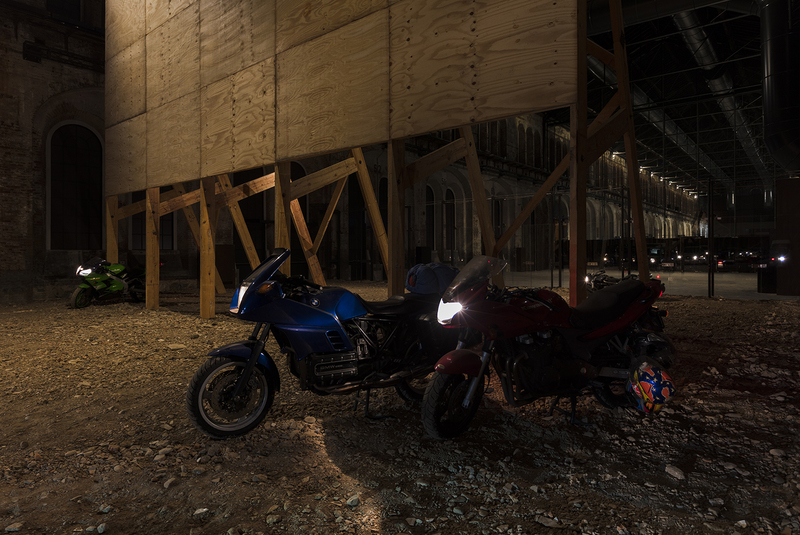 The themes of journey (both metaphorical and real) and transience emerge as a sort of fil rouge to this story that, set inside the OGR, which for over a century was a repair workshops for rail vehicles, finds a perfect setting to amplify the sense of a work deliberately left without predefined keys of interpretation. 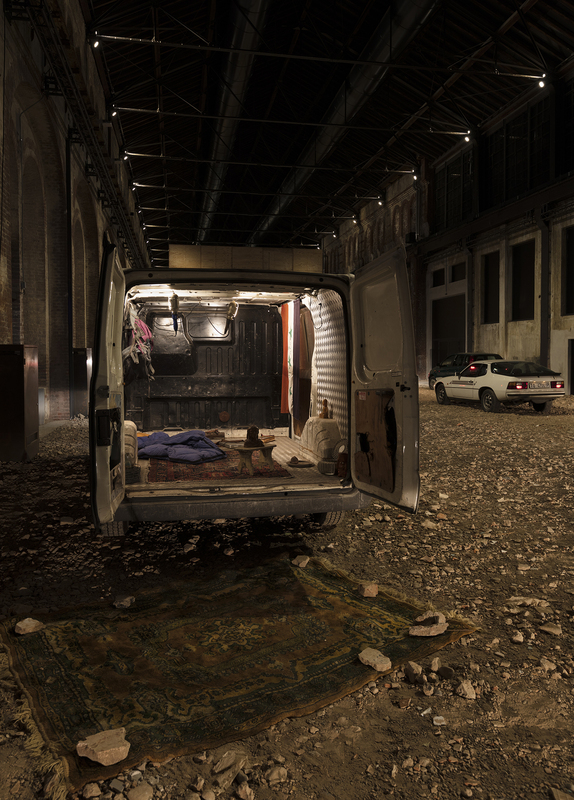 The first piece of the path is a small sculpture, Untitled(intimate sculpture for a public space) (2013), which welcomes the visitor in the foyer of the Officine Nord: a sleeping bag placed on the ground, enclosed in a shrine, in memory of a friend and collaborator, Erlend Williamson, artist and passionate climber, who died more than twenty years ago while climbing in the Scottish Highlands. 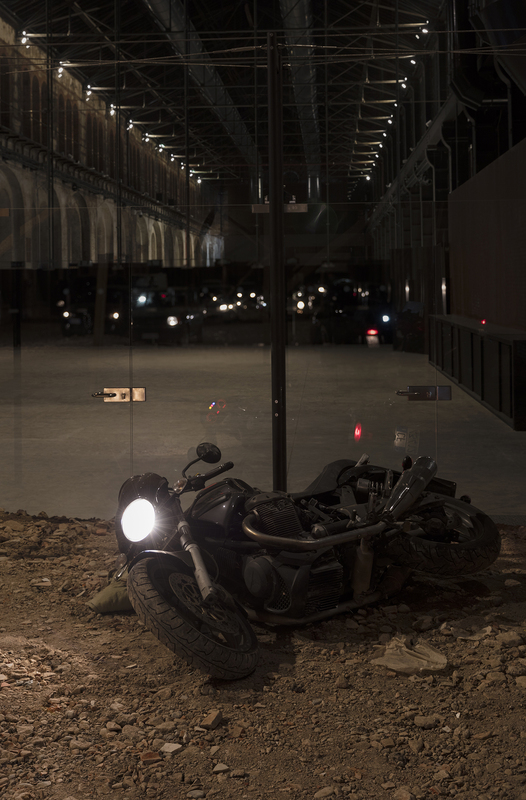 The sculpture, with its intimate and discreet presence, counterbalances the intervention visible through the glass entrance of Binario 1: the transparent threshold allows to see a heap of debris and rubble, a pile of dirt pressing up against the glass wall. Transformed into a vitrine, the new installation resonates with the first work. An enormous wooden structure, similar to a scaffolding, at first visible only from the back entrance, leads into the space. 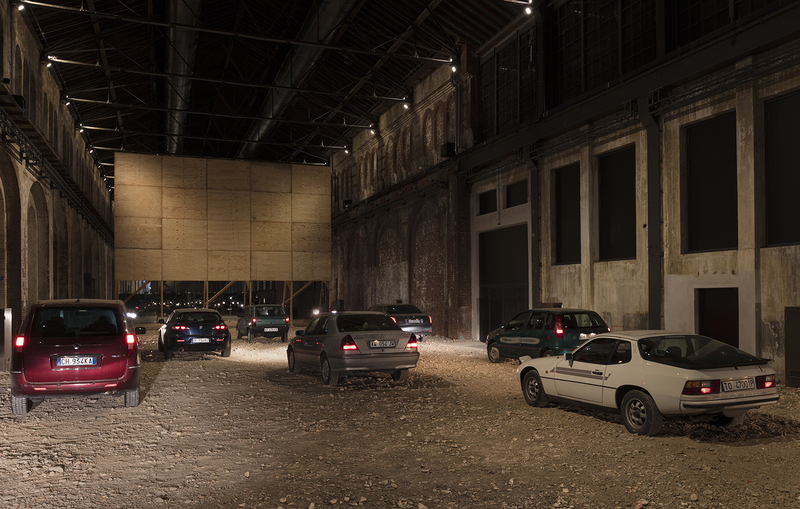 The sculpture looks like a large billboard or the screen of a drive-in: once beyond it, visitors find themselves inside a dimly lit environment where, amid pressed rubble, are about twenty parked cars, covered with dust and in a state of complete abandonment. 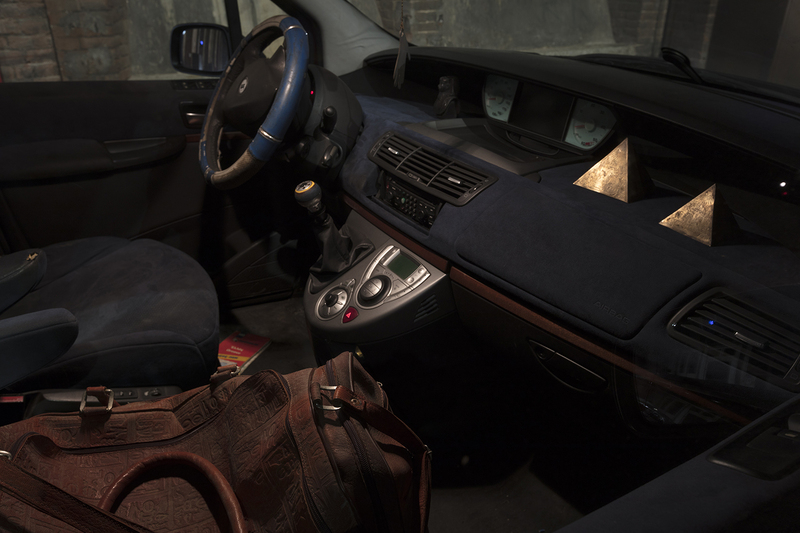 It is not clear why the cars are in that state, but several objects, memories of their previous (real or imaginary) owners carrying traces of the past, can still be found on the car seats. Only a few light sources guide the exploration of visitors, called to interact with the elements of this complex installation, immersed in a spatial and temporal suspension that makes existential contours undefined, even before blurring the visual ones. 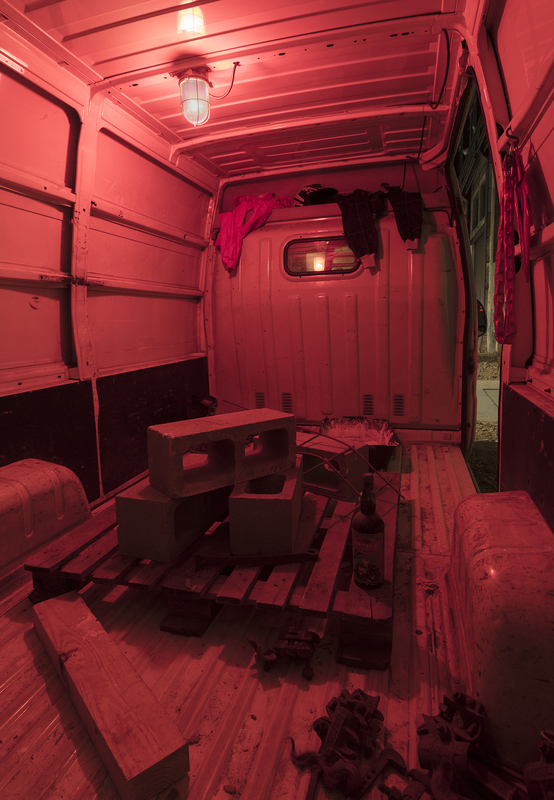 Mike Nelson’s intervention at the OGR mixes into a new workdifferent sources. Various suggestions expand in a continued game of references: the pile of debris forming the floor on which visitors are walking recalls Land Art interventions and happenings like the Earth Roomof Walter De Maria, yet here the ground of the installation is transformed into a dirt parking lot, in which the remains of old buildings, fragments of tiles or waste materials are clearly visible. Different temporalities seem to collide within the installation: a recent past and an almost archaeological dimension (or maybe a near future? ), join to form a dystopian present: cars, that can still be found on today’s streets, are combined with the idea of precariousness that the rubble conveys, the ambiguity between a recent demolition, an in-progress apocalypse and a potential reconstruction. 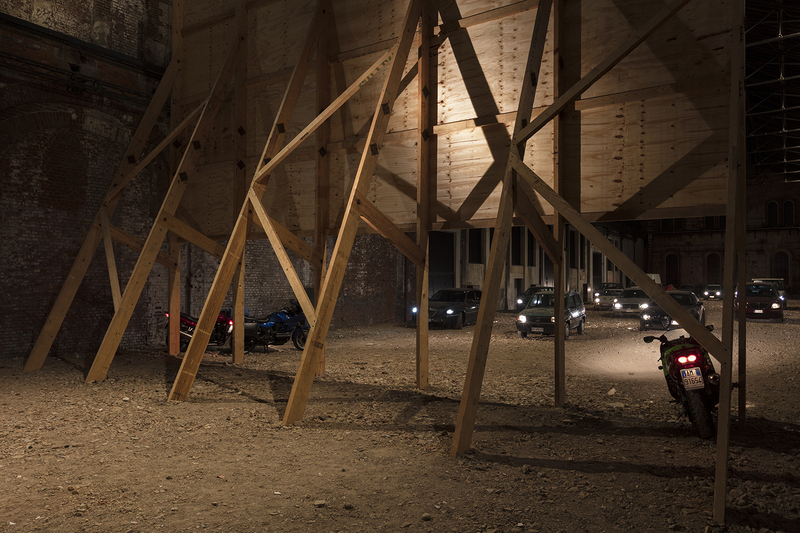 Once again Nelson radically transforms the site in dialogue with the existing structure, creating an atmosphere of expectation and suspension – which recalls great masters of cinema such as Michelangelo Antonioni and Dario Argento, or artists like Ed Kienholz, all sources of inspiration for Nelson’s new work – creating a physical and emotional limbo filled with charm and complexity. The idea of transformation, cornerstone of OGR’s programming, thus materializes in a narrative structure that emerges from the architectural changes in relation to the history of the building, while the objects, carefully selected by the artist and transformed into sculptures, create an articulated stratification of meaning and a path with multiple levels of reading, from a dreamlike journey to science fiction.